Lets start with the stats.The minimum cost of a 1 month fashion internship is £1,019. Over 75% of fashion students and graduates partake in internships of some kind. Some statistics suggest that a third of all graduate interns are unpaid, while others suggest that just 17% of graduates are paid for their work experience. As this is such a vast and very contentious issue, I have reached out to my network to express their views, because in reality, there is no right or wrong; what's important is that we keep the conversation going, because I think we as an industry can all agree that there are problems with the status quo. But I thought I would start by stating my own position on the topic, as a fashion student who has interned in many different guises over the years. In my opinion, there should be no problem with work experience with a company on a short-term basis; I'm talking either an intense period of 1-2 weeks or a longer period of part-time or freelance work. If expenses are paid (traveling within London, decent lunch and refreshments throughout the day), hard-working interns can still make a lasting impression and gain some valuable contacts while learning key skills if the employer is enthusiastic enough about teaching and training. Most of us can find some sofas to crash on for a week if we don't live in London, and get enough paid holiday leave from work or save our student loan or borrow some cash from family or friends (or, god forbid, an overdraft/credit card) to fund living expenses for that short period of time. 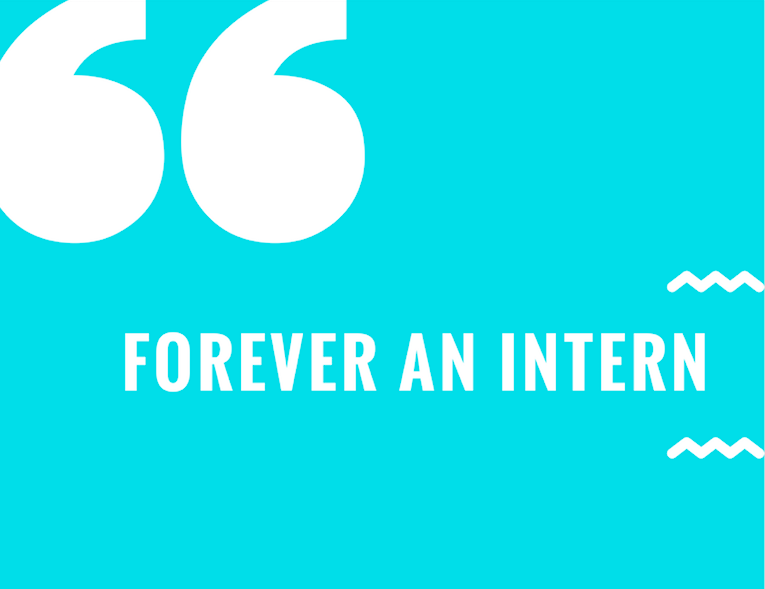 Long term internships, on the other hand, have an overwhelming number of problems and implications. Firstly or course there is the financial side; in my experience I've had to continue working alongside any interning I've done; whether that be doing 5 days in the office unpaid, two 12 hour shifts in a shop on minimum wage, or working 9-6 for a brand and then staying up until 3am working from home on my laptop to make a freelance income. This is because living in London, traveling to and fro, fueling my insatiable appetite for food and coffee, while still paying rent and bills for my home back up North, is simply impossible to do on £5 a day in travel expenses alone. Some companies actually require wannabe fashion interns to pay to take part in these work experience programmes. For example, when researching NYFW earlier this year, I found the website www.fashionweekinternships.com where people are encouraged to splash out up to £650 per week to secure a 'a guaranteed internship within a dynamic fashion industry business' in one of the major fashion capitals. At a recent talk at a London art college from student-led fashion magazine 1 Granary, it was said that “we think interns should be paying to do an internship” because they are getting something out of it whereas employers are going out of their way to help them. In short, it seems that much of the industry believes interns should be grateful for the chance to work for free in a fashion environment, and the request for payment is unfounded. The motivation for 'complaining' about the practice of long-term unpaid internships is not, as it may seem, an outcry about my own financial situation and cynicism for the state of my future career. My concern is that if unpaid internships continue to be legal, and widely accepted, in this country, the fashion industry will continue being run by upper class people from Southern England, and we will never truly make systematic change. There is so little diversity in class (and therefore race, religion, age etc) in the major companies throughout London because the only people that can afford to intern for 6-12 months full time, therefore almost guaranteed to get at least a junior job position in the near future, are those with rich parents. Therefore, the message that the fashion media drills into us continues to be the same; white, skinny, young, privileged women are representatives of fashion as a whole. Another issue I have is with the London centric nature of the fashion industry. In general, people from London (and their parents) make a higher than average salary, and have higher than average access to industry opportunities due to their geography. Most internships on the mainstream fashion market are based in central London and require interns to live centrally too, meaning if you're studying in the Scottish Borders, you have half the chance of 'making it', as brands offer very little in terms of flexibility of time and location. Next up, there is the big elephant in the room: mental health. Every tip on every website and magazine for interns to 'succeed' is to work hard, harder, hardest. Go above and beyond your calling. Know what your boss wants before she even asks for it. Work double shifts, triple shifts, give up your social life completely. Who needs sleep? The competitive atmosphere in these types of roles is rampant, with every intern knowing that the possibility of a paid fashion job is slim; name-dropping, asking questions and offering help at every intake of breath, shooting a nasty side eye after receiving that much sought-after second of praise. This combined with the often harsh punishment for making simple mistakes (I once had a serious sit-down shouting-at for mis-spelling a tweet, and was ignored all day after asking for an afternoon off), and the endless onslaught of somewhat demeaning jobs- washing dishes, making coffees, collecting dry cleaning etc, offers up a very unappealing plate of anxiety and self doubt indeed. While, as an adamant advocate of ethical fashion, I believe that all hard work should be fairly reimbursed and all workers within the supply chain should be fairly treated, on the other hand, so long as there you are not being unwillingly misled, it is your personal, active, aware choice to take up an unpaid internship. I have a problem with public whistle-blowing (hence why no companies are named in this article) because I get the feeling many interns play along while on the job, only calling out 'miscarriages of justice' much later which leaves brands in an uncomfortable position of explaining that this was all 100% voluntary on the intern's part. There have been multiple cases in recent years of people accepting an unpaid internship and then suing after its completion for unpaid wages and overtime compensation, for example the scandalised lawsuits at Condé Nast, The Row, and Alexander McQueen. I attended a panel event last night where representatives of Hearst and Who What Wear answered my questions about the ethics of unpaid internships in fashion. The overall view was that long term placements with no expenses paid should no longer be the industry norm, and when considering whether it should be the responsibility of the employer, employee or potentially the government and larger industry bodies, it was suggested that there needs to be a more cohesive, united movement from the fashion world as a whole so that we can ensure true diversity. One panelist advised that if you are second-guessing taking an unpaid internship, ask yourself, are there 5 valuable things I will gain from this experience? If not, either don't take it, or demand more. I like this approach. "After my second year at uni in the summer I went down to London to work for [a designer]. I worked for 3 months down there. My uni course really encouraged us to go down to London...I worked almost full time whilst being full time at uni and saved up money throughout the year but I did get help from my parents to be able to afford to go down to London and work for free for 3 months. I’d heard horror stories about internships, but I worked really hard and felt really appreciated. I made a really big mistake once and they didn’t get angry or have a go at me, they were all very aware that we were there for free. When I went back to uni after the summer I did feel more confident as I learned new skills and had an idea of what the industry was really like." "Whilst on a uni project down in London I had a trial day for a designer... he was horrible. Didn’t even look at me when I was waiting in the reception. The room where the interns worked was ridiculously small. Didn’t get shown around or told what to do or anything explained to us at all. We ate lunch on the floor in the hallway. The intern manager wasn’t very helpful, she was just as rude. At one point the designer came in and asked why we were doing nothing. We said we haven’t been asked to do anything or even shown where any rooms or anything is. We hadn’t even been shown where anyone else worked! That was horrible. At the end of the day I didn’t even say goodbye, I just left. That was not good." "I wish you didn’t have to intern, but in the creative industry the value of the craft is very undervalued and creatives feel uncomfortable charging for their time and skills. As a skillset it can be difficult to pin point the point where you are qualified almost. What makes that person qualified to start charging for their time. And I think that’s the big issue. " "My experience wasn’t a formal internship however it was very much accepted that to get into that industry you had to work for zero money. I found it to be quite shocking and exploitative. A girl I knew that had been working for [two designers] had been working for zero money for a long time whilst her wealthy parents paid her rent. I was paying £850 for a studio flat a month so I had to ditch any plans of textile design and get a temp job in an office. I’m still glad I went to live in London and try it out though. If I hadn’t done it, I would have felt haunted by the ‘what ifs’"
"Basically i think that people outside of London forget that anyone else exists / doesn't understand why they don't live here. I never did an internship in London because I couldn't afford to be there. It seems crazy that in order to get a job you need to pay so much to get any kind of experience and makes it near impossible for us. I think maybe unpaid internships are only ok if you are getting something else of value from it, otherwise it’s exploitation of free labour really. People feel that exploitation is just a “natural” part of the system but fashion is a system just like any other industry." "I wholeheartedly disagree with unpaid internships! We campaign for workers rights internationally but why would anyone think it's ok to ask to people to work for free?!? Even if its training they are still giving their valuable skills and time and energy to your business so they deserve to be paid for their time. Simple!" "I've done 3 internships and it cost me all of my savings to live unpaid in London for short time blocks. £3000 at least. The experience was incredible, however that's all I have from it. I have not gained any further opportunities from these internships in terms of my career. Still stuck in retail." "I did an internship with a fashion studio years ago; it was originally meant to be unpaid and I ended up negotiating for wages. That was about 15 years ago though so might not be relevant to internships now. I did find out that of the 3 interns, 2 were paid and 1 wasn’t." "I did an unpaid internship once and I bailed after she had me filling up hot water bottles for her PMS. I kind of just never did it again. And I don’t know if unpaid internships are as much the problem anymore: what’s the problem is that the internship never REALLY ends. I’ve been paying out my own pocket for projects and building my career from day 1 because sometimes my skills in return can’t cut it. When I did an internship, I was fully aware of the fact it would be that way. What I didn’t realise is people still think they’re doing you a favour working for them." "I did my first unpaid internship in London 5 years ago, in the fashion department at an editorial, 3 months full time. They had 3 unpaid interns full time ongoing. I did learn a lot and enjoyed the time there, although my manager was not flexible with lunch breaks, doctor appointments etc. My 2nd internship was part time at a fashion designer's studio, as production intern. I didn't enjoy that much of my time there as it was not very organised and we were lot of interns, around 6-7. We didn't have room to do our work and not enough chairs to eat at." "I think big companies like the large fashion houses/creative corporations are creating a loop of privilege for new designers. Only those who have a financial support network can afford to get large scale industry experience. It makes me upset and angry. In my opinion it’s Social Cleansing Lite in the arts." "I’m all for free work if it’s a barter deal. That’s pretty much how I survive! I also don’t have an issue with new designers who are not bankrolled to get assistants to work for free if they are local, students who have a loan and will be getting credits for the job, and lunch etc is provided." Now we've heard a few opinions first-hand experiences, what's next? If you're a brand looking to hire an intern, or a student/graduate looking to get an internship, how do you approach this delicate subject? Firstly, you should know that paid internships do exist. Look for these on websites like Fashion Workie and Find Your Intern, or even better, contact the brands you love directly and let them know what you have to offer. Secondly, you need to know that there are organisations out there fighting for fair payment and treatment of interns. Check out Adopt an Intern, which is a UK company offering small and medium sized business to hire exceptional candidates for paid internships that lead to genuine career progress, and Intern Aware, a national campaign for fair internships and a more diverse working world. Finally, look to other industries as key examples for how a system of paid internships, apprenticeships, placements and fellowships. Think about friends you may have that have gone through these processes in medicine, law, finance, and trades such as electricians, plumbers and mechanics. It is possible to work while you learn and make a decent living doing it; in most cases this doesn't affect the employer negatively in any way financially, in fact it only gives them better credentials on the national stage, and allows them to scout for the freshest new talent. 1. The internship, even though it includes actual operation of the facilities of the employer, is similar to training which would be given in an educational environment. 2. The experience is for the benefit of the intern. 3. The intern does not displace regular employees but works under close supervision of existing staff. 4. The employer providing the training derives no immediate advantage from the activities of the intern and on occasion its operations may actually be impeded. 5. There is no guarantee of a job at the conclusion of the internship. 6. Both parties understand that the intern is not entitled to wages for the internship. This is also a really helpful article on The Fashion Law for further reading on the legal side: Do You Have Unpaid Interns? If So, Read This! In short- there should never really be an exception to the law of the National Minimum Wage unless they provide measurable benefit to the intern, and not the employer. But for me, the first priority has to be transparency; from the word go, the employer must be extremely clear as to what they are offering to, and what they are expecting of the intern. Misunderstandings and miscommunication in the past have led to a lot of grief during my internships that could have easily been avoided, and I truly believe that if rules are set in place and followed through by the industry as a united group, everyone could be entitled to a more positive, and fair internship experience. So, what do you think? Are internships in the fashion industry simply a rite of passage or a form of exploitation with long-term implications? Let me know in the comments!